Bruce McClure studied architecture and visual art, lives and works in New York and is one of the rare exponents of the tradition of expanded cinema linked to the tensions of the world of visual art and music coming from North America. He has worked with John Cage, recognizing the importance of his work from Ken Jacobs, and is the last of the originals in his research interested in the approach and vision of Marcel Duchamp (from cinema to Rotorieliefs). Although his work has been shown at an international level in museums and galleries in the form of films and installations, he has found space through unforgettable performance above all in the arena of experimental cinema. 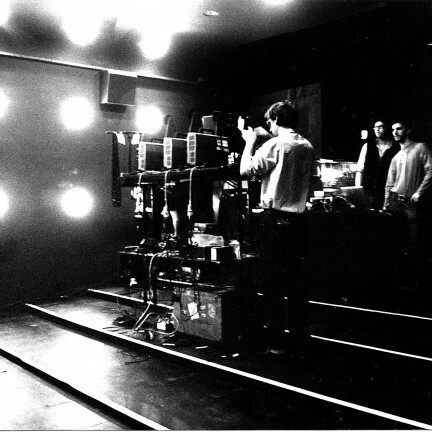 He has realized a series of live events and installations with modified projectors (as opposed to many working live with film, McClure intervenes directly on the projector, distorting its functionality) and other self-produced devices that produce projections of light and geometric forms in assonance with the modality of the most radical structures of experimental cinema, where sound and image mix in a crescendo that range from typically minimal cadences of the avantgarde almost to traditions of the most rigorous analogue techniques. Each live calls for the use of effect and loop pedals, which McClure employs to interact with the task of adjusting the projection lenses.